When looking at the documents of Vatican II, it is my assertion that though they represent a radical break from the way the Faith has always been understood in the past, they nevertheless can be interpreted in an orthodox manner (despite their ambiguities) and therefore do not constitute any formal heresy or anything like that, as some Sedevecantists would argue. For many conservative pop-Catholics, the buck stops there. Vatican II can be interpreted legitimately, so that's all there is to it, and any attempt to dig deeper into the shortcomings of certain documents, point out the ambiguities in the texts, or behave in any way that suggests that you do not believe Gaudium et Spes to be the most profound statement ever made by Magisterium gets labeled as fault-finding or potentially schismatic behavior. However, I have always taken the position that it is not good enough to say, "Well, the document can be interpreted in an orthodox manner." I recall many years back after Walter Kasper's Covenant and Mission came out, Dr. Scott Hahn was on EWTN explaining away the statements of the Cardinal in terms of, "Don't worry - there's statements in here that if we interpret in such-and-such a way will make this document conform with orthodoxy." What a pitiful commentIn the past, positions of theologians were condemned because there was the possibility that they could be interpreted in a heretical manner. Now we have theologians telling us that documents can be interpretd soundly. How pathetic! My position has always been this: It doesn't only matter what the document says, but how will others interpret it? Based on the language and tone of the document, what do other people take it to mean? This question only arises with the issue of ambiguity. An unambiguous document needs no such explication. Nobody draws multiple meanings out of the Syllabus of Errors. There are no theologians standing around arguing about the right interpretation of it. For crying out loud, a Magisterial document is itself supposed to be an explication of the Faith. Why should they be so complex that we need explications of the explications? It often happens that within the Catholic Church, we can look at these documents in light of tradition and say, "Okay, I guess I see how one could square that away with Tradition" (no matter how tenuous). But then you get somebody outside the Church who looks at the document and is taken in the totally wrong direction due to the document's ambiguities (whether intentional or unintentional). Boniface, I am disturbed by the readiness with which you devour islamophobic messages..this is specially puzzling in light of the official position of the Catholic Church with respect to Islam and Muslims. In a document entitled "Nostra Aetate" dealing with the church's relationship with non-christian religions. The section on Islam begins thus: "The Church regards with esteem also the Muslims. They adore the one God, living and subsisting in Himself; merciful and all-powerful, the Creator of heaven and earth, who has spoken to men." Moreover, the Catholic Catechism states: "The Church’s relationship with Muslims. The plan of salvation also includes those who acknowledge the Creator, in the first place among whom are the Muslims; these profess to hold the faith of Abraham, and together with us they adore the one, merciful God, mankind's judge on the last day (Catechism of the Catholic Church, paragraph 841, quoting Lumen Gentium 16, November 21, 1964). Isn't this interesting? I say something critical of Islam, and a Muslim comes back and throws Nostra Aetate and the CCC in my face! Now, I know that if you are a theologian, you will understand that neither of these documents explicitly affirm that Allah is the same God as the Blessed Trinity - but it does tell me that a cursory reading of them by any other person, even a Muslim, gives them the opposite impression! So, if we have an obligation to preach the truth, we must ask ourselves as a Church - perhaps our documents do technically speak the truth, but even so, what do others think they say when they are reading them? I obviously don't think my Muslim commentator to be correct in their overall point, but I do have to agree with them on something: if you were to pick up Nostra Aetate or read the CCC passage quoted, I think one would get the impression that this is the message of the Church. 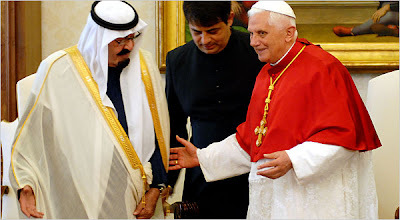 No wonder the Muslims keep making overtures to Benedict - they think the Church teaches that we all worship the same God! This Muslim made a very forgivable and simple mistake - they picked up the Church documents, read them, and took them at face value! That's the way documents should be read in a perfect world - without blogs like this one having to expose ambguities, without theologians on EWTN explaining the right "ecclesiological standpoint" for interpreting a document, without Muslims and non-Christians reading the same documents and coming up with interpretations completely 180 degrees from the correct standpoint. And you know what? It is not this Muslim's fault for getting this interpretation. Not at all. It is our fault - the Magisterium's fault for wanting to please everybody and offend nobody except faithful Catholics. This is another example of what I have always said about ambiguity: it serves nobody. It neither reinforces the faithful in their belief, nor does it clearly explain it to unbelievers. It gives non-Christians the wrong ideas and just confuses Catholics. So, when the Magisterium is getting together these documents, I think they have a real responsibility to say, "What unwritten message are we conveying with this? Even if our words say one thing, what impression will this document leave on others?" Obviously the Church does not write its documents with the sensitivities of non-Christians in mind (or perhaps it does, and that is the problem), but they should at least make sure the message is clear. There is a big difference between people not liking the truth when it is preached and simply not understanding the message, and what we have here is a case when neither the truth nor the message is clear.